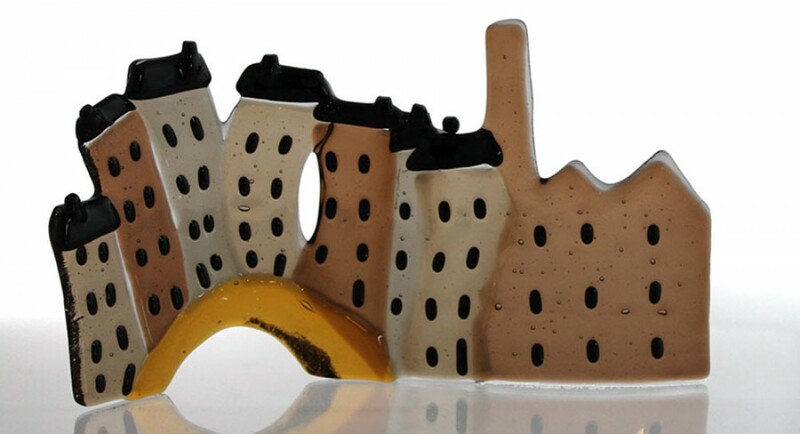 I am a glass artist based on the edge of the Pennine town of Hebden Bridge where I work from my home studio creating kiln formed glass work. My work is all fused glass which involves several processes – design, hand cutting from sheets of glass, use of glass powders and enamels, flame work, kiln carving and finally multiple kiln firings and cold working by hand. A keen cyclist, I spend much of my spare time cycling the beautiful hills of Yorkshire and holidays cycling the French Alps and Pyrenees. I take inspiration from my love of the local landscape of hills and mill towns and my passion for cycling. My current work celebrates both Yorkshire and my excitement about the Tour de France coming to the area.